I didn't realise until yesterday just how long it has been since I posted here, and I only realised because I offered to write a guest post over at magnetoboldtoo and then my head exploded when I realised how much time writing even a short post can take, especially when it involves pictures and links. At the time of publishing this my guest post hasn't gone up yet (I didn't write my blurb in a timely fashion due to the below festivities), but I'm sure it will be in the next week or so and will let you know when it's out there. It's about how chokos are the knobbly, green symbol of my overcommitting myself. But I didn't drag you all down here to chat about chokos (although I will be posting about what I did with that choko some time in the near future. 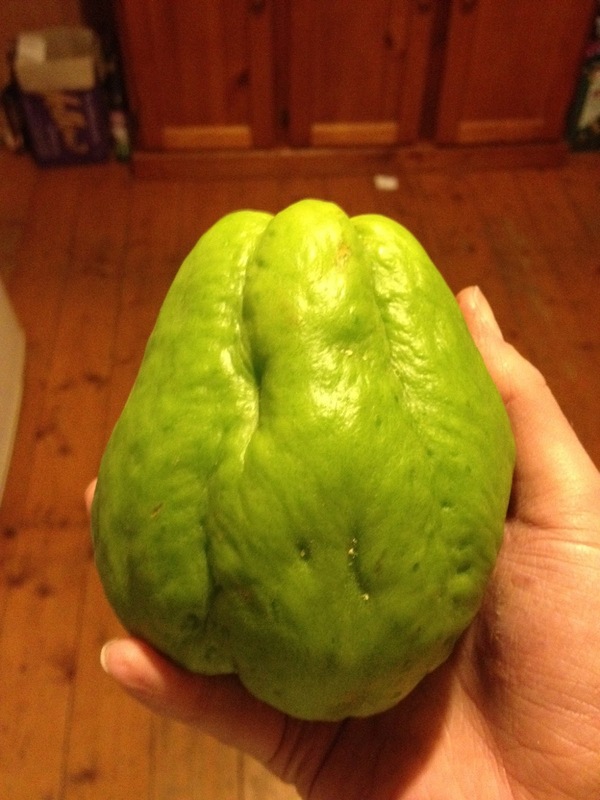 It will probably be entitled Chokos: A Very Confusing Vegetable). Nope, I dragged you down here to tell you about the cake I made for my BFF Emma's 30th birthday. There will be another post that comes later, telling you all about the other three classes I did leading up to the final class of Wilton Gumpaste and Fondant (where I made the bottom tier of this one), but for now I'll just show you the finished product from the final class and take a quick moment to admire the cake before I tell you a bit about what went into it. The brief was "I WANT A PINK BIRTHDAY CAKE!!! PINK, I TELLS YA!!! PINK, PINK, PINK!!!" 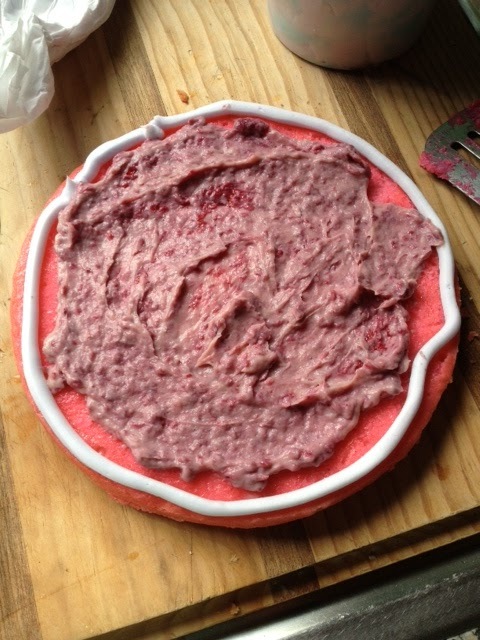 (disclaimer: the phrasing of the cake brief in no way resembles what came out of the birthay girl's mouth, except maybe the words "pink" and "cake"). So I decided that it was going to be pink, inside and out, dagnammit! 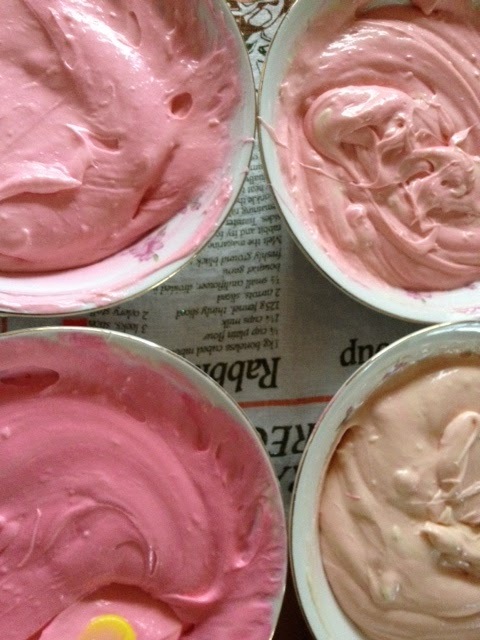 And a little bit of food dye goes a long, long way. It took a little while to get the shades different enough from one another, and you also have to use your imagination because the colours develop when you apply heat and time. So I now had two four-layer cakes. Baking multiple layers is a bit time consuming and so unless you really love the person you're giving a layer cake to, or they're paying you for your time, I'd probably go down the path of a single cake that has been torted in the future. Or maybe swirls. Swirls would be okay. 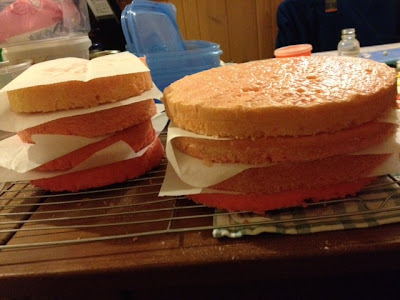 3) Sandwich the next layer on and press down gently and turn slightly; 4) You may wish to refrigerate it to set it a little, or put skewers in taller, multi-layer cakes to prevent them from sliding - just make sure that whoever cuts the cakes is aware that they are there! This is the tier I covered at home. 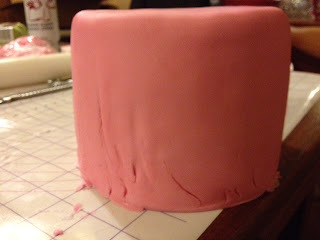 The problem I had encountered during class - the corners cracking because the fondant on the sides dragged it down and I didn't catch it in time - was not one I repeated in this tier. My corners were just fine. Unfortunately, the sides were not. They kind of wrinkled and I don't know where I went wrong or how to fix it. If anyone can let me know how to prevent wrinkles that would be super! My instructor didn't tell me how to deal with them because they simply didn't happen to anyone while she was watching. Maybe it's because it was a taller, narrower cake. I don't know *sighs* On the plus side, I now knew which side the back would be! I also made the mistake of covering it in relatively poor lighting, and, upon examination in daylight, found a couple of air bubbles that it was too late to fix. Oh well, live and learn. The board is covered with fondant (Lesson 3) and the daisies were taught in Lesson 2. The frills were taught in Lesson 4, along with how to stick the cake to the board (CMC glue and a couple of small balls of fondant). Altogether I am fairly pleased with the cake. There was quite a bit of damage in transport, and I think next time I make a multi-tiered cake involving frills I will have to apply the ones on the top layer at the venue (or else transport it already assembled. This makes me very nervous!). I also have to be less clumsy with my hands - I kept knocking it when I was decorating because I'm not terribly spatially aware. Be especially careful with your tools, and, until you're quite practiced at it, I suggest removing rings, too. And that row of three daisies weren't part of the original plan, but some frilling fell off in transit so they're hiding the damage were always supposed to be there. Thanks Lorraine :) The flowers were quite fun to make. I know! I think the biggest thing that trips me up is that I always underestimate how much time it will take. It always gets done, but towards the end the adrenaline starts pumping and once it's delivered you kind of collapse in a wobbly, relieved heap in the corner. Thanks Cher. I call my cakes "rustic", too, and always use pretty flowers or ribbon to cover the holes and cracks :) I think that's why I'm a fan of buttercream - of the rough look, that is, because I just can't make it perfectly smooth. Fondant and I aren't good friends just yet but hopefully that improves soon! wow That looks great! It makes me nervous to even think of using fondant but I am at the same time anxious and looking forward to try it! I just don't want it to turn into a big mess... but your post has inspired me! Did you use any support in the center of the cake (in the inside) so it wouldn't get crushed from the weight? or it wasn't too heavy? Just wondering of those things... :) Thank you for sharing! you totally rock the cake making my friend.